Ejector Pins are through-hardened to Rc 60-63. Featuring heads that are finished and chamfered for proper seating and annealed to facilitate machining, Regal Thru-Tuff(TM) M-2 HSS Ejector Pins are stocked in 6, 8, and 10 in. lengths in fractional (TT type) diameters, and .0005, .001, .002, and .005 in. standard oversize (TTO type) diameters. Available in straight/shoulder styles, they are suitable for molding nylon and other parts with high glass content resins. Modifications such as heat flats, vents, and spherical radii are optional. A full line of ejector pins in inch-fractional sizes and oversize diameters that are suitable for molding nylon and other parts with high glass content resins is available from Regal Components, Inc. of Clearwater, Florida. Regal Thru-Tuff(TM) M-2 HSS Ejector Pins are offered in popular inch-fractional sizes and oversize diameters in straight and shoulder styles to provide optimum flexibility in mold repair. Featuring heads that are finished and chamfered for proper seating, these pins are through-hardened to Rc 60-63 and the heads are annealed for maximum toughness and easy machining. Designed for molds of high glass content parts and quick flashing materials which require tighter fitting, Regal Thru-Tuff(TM) M-2 HSS Ejector Pins are stocked in 6", 8", and 10" lengths in fractional (TT type) diameters, and +.0005", +.001", +.002", and .005" standard oversize (TTO type) diameters. Modifications such as heat flats, vents, and spherical radii are optional. 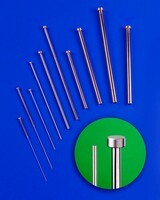 Regal Thru-Tuff(TM) M-2 HSS Ejector Pins are priced from $2.97 ea., depending upon type and quantity. Specials for any .0001" increment are also offered.